Yale physicists have given Schrödinger's famous cat a second box to play in, and the result may help further the quest for reliable quantum computing. Schrödinger's cat is a well-known paradox that applies the concept of superposition in quantum physics to objects encountered in everyday life. The idea is that a cat is placed in a sealed box with a radioactive source and a poison that will be triggered if an atom of the radioactive substance decays. Quantum physics suggests that the cat is both alive and dead (a superposition of states), until someone opens the box and, in doing so, changes the quantum state. This hypothetical experiment, envisioned by one of the founding fathers of quantum mechanics in 1935, has found vivid analogies in laboratories in recent years. Scientists can now place a wave-packet of light composed of hundreds of particles simultaneously in two distinctly different states. Each state corresponds to an ordinary (classical) form of light abundant in nature. A team of Yale scientists created a more exotic type of Schrödinger's cat-like state that has been proposed for experiments for more than 20 years. This cat lives or dies in two boxes at once, which is a marriage of the idea of Schrödinger's cat and another central concept of quantum physics: entanglement. Entanglement allows a local observation to change the state of a distant object instantaneously. Einstein once called it "spooky action at a distance," and in this case it allows a cat state to be distributed in different spatial modes. The Yale team built a device consisting of two, 3D microwave cavities and an additional monitoring port—all connected by a superconducting, artificial atom. The "cat" is made of confined microwave light in both cavities. "This cat is big and smart. It doesn't stay in one box because the quantum state is shared between the two cavities and cannot be described separately," said Chen Wang, a postdoctoral associate at Yale and first author of a study in the journal Science, describing the research. "One can also take an alternative view, where we have two small and simple Schrodinger's cats, one in each box, that are entangled." The research also has potential applications in quantum computation. A quantum computer would be able to solve certain problems much faster than classical computers by exploiting superposition and entanglement. Yet one of the main problems in developing a reliable quantum computer is how to correct for errors without disturbing the information. "It turns out 'cat' states are a very effective approach to storing quantum information redundantly, for implementation of quantum error correction. 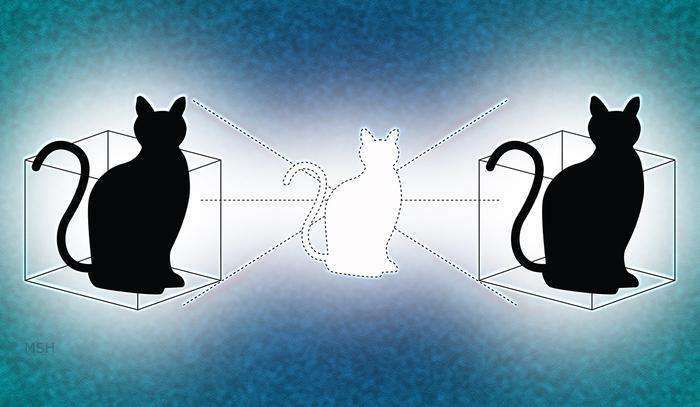 Generating a cat in two boxes is the first step towards logical operation between two quantum bits in an error-correctible manner," said co-author Robert Schoelkopf, Sterling Professor of Applied Physics and Physics, and director of the Yale Quantum Institute. Schoelkopf and his frequent collaborators, Michel Devoret and Steve Girvin, have pioneered the field of circuit quantum electrodynamics (cQED), providing one of the most widely used frameworks for quantum computation research. Devoret, Yale's F.W. Beinecke Professor of Physics, and Girvin, Yale's Eugene Higgins Professor of Physics and Applied Physics, are co-authors of the paper. The research builds upon more than a decade of development in cQED architecture. The Yale team designed a variety of new features, including cylindrical 3D cavities with record quantum information storage time of more than 1 millisecond in superconducting circuits, and a measurement system that monitors certain aspects of a quantum state in a precise, non-destructive way. "We have combined quite a lot of recent technologies here," Wang said. ...has a conceptual problem: a box that seals the insides from all outside influence is essentially putting the contents of the box outside of our reality, because what we can't interact with essentially does not exist for us. And since we cannot destroy or create energy, which the opening and closing of the box would do, the act of putting the cat in the box must transfer the information of the cat out of the box as the lid closes, and putting the information back in as the lid is opened. Otherwise we could break thermodynamics by opening and closing the box. Therefore, it must be that the cat - or the information about the state of the cat - exists outside of the box while the experiment is running and becomes the cat again when the box is opened. The superposition of states is an illusion since the box was empty all along, and it's we ourselves that changes what happens to the cat - not what's in the box. See, if the box did contain the cat, and it did isolate it from our reality with no transfer of energy and information to do so, then we could place a heavy cannonball in the box and design a sort of cavendish experiment where the opening and closing of the box would cause a gravity wheel to run and create work out of nothing. To counteract that, the opening and closing of the box must require work equal to the information that is put into hiding, and again since energy can't be created or destroyed, the properties that are hidden by the box must cease to exist inside the box. In other words, the cat dissapears when the lid closes, and re-appears when the lid opens, and whether the cat is dead or alive depends on what happened to the information while it was -outside- of the box during the experiment. The "box" in the thought experiment is only meant to emphasize the point that "an observation" has not been conducted yet. It is possible that a quantum state can exist in a coherent superposed state long enough, .....without decoherence with the environment, ...that this "box" analogy with "observation" is logically appropriate. IOW, if the point is made that 1) the quantum state is unknown and 2) it is in a coherent superposition state (no decoherence),.... then the "box" becomes superfluous to the thought experiment. The superposition of states is an illusion since the box was empty all along, and it's we ourselves that changes what happens to the cat - not what's in the box. The superposition of states is a component of the description rather than an observable entity of itself,.... a superposed state can not be observed as such. The reason being are the intrinsic conditions for observation to be possible at the macroscopic scale,.... which always collapses the superposition [given assumed interpretation]. The illusion is the macroscopic realm,... the concepts we evolved with to synthesize experience. IOW, its we ourselves that subject the underlying reality to conditions for observation and therefore "collapse" the superposed state into one that is contingent upon the experimental conditions. ... this would imply that "observation" is distinct from "quantum interaction", ....and that is indeed the whole point of the Schrodinger cat thought experiment and the box,... that "observation" necessarily implies an observer outside the quantum system description. You could extend the thought experiment to "Wigner's friend". Yes, but the box also requires that no interaction between the quantum state and the environment happens or the experiment is ruined. Observation does not only include the experimenter, but also the direct environment of the box. this would imply that "observation" is distinct from "quantum interaction"
It isn't. If we can feel the object's gravity through the box, then we feel without any explicit "observation" where in the box the object is, and therefore its position is contiuously being observed by its environment. It must generate the gravity field that the rest of the universe is seeing, so it can't be just anywhere. that "observation" necessarily implies an observer outside the quantum system description. It doesn't. It doesn't matter if the observer and the observed are both quantum systems - what matters is what they know of each other and what state of things they agree on. The box is a decoupling mechanism between two quantum systems, and when the information flow between the two is cut, they both go into superpositions in respect to one another - nothing is known about the other state. When they are brought back into contact, they settle down to an agreement about what did happen and what is. Now, that is assuming there are two independent isolated quantum systems. We don't have that. What we have is our quantum system, and when we try to isolate stuff from it to create a superposition, we end up destroying the object or its properties and assimilating its information, and re-creating the object with its properties when we decide to "observe" it again. I hold the view that we live in a "universal wave function" which appears to be behaving in a classical way simply because it maintains consistency. Things can take superpositions while they're not being observed because not being observed means that the property or thing within the superposition makes no difference to the overall state of the world and is free to take any state. With many many things that are continuously interacting, the degrees of freedom for most things are limited to such a degree that a classical world emerges. Things can change but not very drastically within a light-second of each other, so every atom or particle is in a sense keeping the others in check. So, in the Shrödinger's box, we're trying to make it so that the state of some thing makes no difference to our universal wavefunction, so the cat could be "dead-alive" in there. That implies that we change the universal wavefunction accordingly to make the experiment, to remove the cat from it. And in order to make the cat dissapear from the universal wavefunction, all its energy and information must be "absorbed" for a lack of better expression, into the rest of the system and transformed into something else. Then we pretend the cat is in the box while its information is going around in us, being subject to causes and conditions in the external world, and upon opening the box we again change the universal wavefunction to include the cat and put the information back into the form of a cat. Because we pretended that the cat was in the box all along, we get the feel that something completely unpredictable happened - a superposition that collapsed into a random state. What really happened is that our evolving universal wavefunction decided the cat is dead or alive and created one just that way because it is consistent with the overall state of the universe. Now, it doesn't matter if it's a cat we put into the box, or a single electron. When we put an electron into a superposition of spin states, we simply erase the property of having a spin alltogether from the electron. Then later on when we measure the electron, we cannot avoid choosing how it comes out - although it doesn't seem like we do. Entanglement too can be seen as just carrying two Shrödinger's boxes where opening one box causes information from the surrounding reality to "rush in" and make real the property that was previously hidden, and since the universe filled one box with one thing, it must fill the other box with the other thing: by the time we come together to compare results, the information about what was in each box has already travelled between them and the universe has agreed what was in each box to form a consistent history. -There is no information travel between entangled systems. This has been experimentally refuted for <=c. -What QM experiments show is that the "act of observation" creates the conceptual-values of the attributes,..... that did not exist beforehand. This is implicit in the mathematical formulation as well. -A universal wavefunction description is not possible to have as a component of actual observation, and generally such a notion concerns philosophy of physics. The salient point of the Schrodinger cat thought experiment is that an observer must exist outside the given quantum system. This is NOT to say that that observer is not himself a quantum system, but only that the wavefuntion description can not include the observer,.... unless you have another observer in hierarchy. ..... in practice one does not have a wavefunction description of the environment and oneself. In addition, decoherence (interaction with the environment) does not solve the core 'measurement problem' in anycase, as it does not result in a particular conceptual-value vs some other. Philosophically, I do agree with you about reality being "one thing" if that is what you meant by "universal wavefunction",.... but keep in mind that "wavefunction" is a quantifiable mathematical description,.... and has never been observed as "a thing" unto itself apart from this. Yes, but the box also requires that no interaction between the quantum state and the environment happens or the experiment is ruined. This is correct and it IS possible experimentally to have an isolated superposed state. The "box" is only meant to expression this,.... NOT to interject an environment to over complicate the thought experiment. Observation does not only include the experimenter, but also the direct environment of the box. Yes this is absolutely true, ...however raw 'quantum interaction' with the environment does not "collapse the wavefunction", EVEN had you a quantified wavefunction description of the environment and quantum system under investigation. by the time we come together to compare results, the information about what was in each box has already travelled between them and the universe has agreed what was in each box to form a consistent history. It is possible (and has been done) to conduct an entanglement experiment where the measurement results of each system are registered in less time than any <= c signal could travel between them. There are objective-collapse hypothesis [Penrose] that make use of gravity as the mechanism, however these are non standard QM and have never been empirically tested to justify beyond speculation. So they use 1 entangled bit as an operator and the second entangled bit to verify the state of the first bit was correctly observed? @Eikka, a great deal of the logical complexity goes away if you accept that superposition is a real state, but one we can never detect because we can only detect by interaction, and by its nature interaction causes the superposition to resolve into one of the alternatives of the superposition. Over an ensemble of particles in the same superposition state, the resolutions will come out according to the mixing angles of the appropriate matrices, by which I mean the CKM and PMNS matrices and the probabilities derived from them. This is merely accepting the Born Rule as fact, nothing more. It's also a core concept of the consistent histories interpretation. And anyone who knows the three polarizers experiment will see that this is actually realized in real-world experiments. Shroedinger never intended that anyone should confuse the "quantum cat" with a real cat. He was making the point that classical logic does not apply to quantum systems; the cat is either dead or alive at any given point, because it is a classical system; if the box had glass sides, we'd see exactly that. Quantum particles can be "in the box" because while they're propagating and not interacting, they can be in a superposition state, which no classical system can be. Thus both entanglement and superposition are quantum states that have no classical analog, but must be accepted a priori if we accept that quantum mechanics is a real description of real phenomena at quantum scales. And given we can retrieve classical phenomena from them, it is difficult to argue otherwise. "You" are a classical system, so that's correct, as long as we're not talking about some hypothetical (and frankly, unrealistic) "quantum point of view." Quantum systems can be in two places at once if they are in a superposition of location under Heisenberg uncertainty, at least if you accept the Born Rule as a description of quantum reality. ....And I'll add, that "the supposed communication between the two entangled states" would have to travel on the order of tens of thousands times c,.... so it is generally accepted that there is no information communicated. one we can never detect because we can only detect by interaction, and by its nature interaction causes the superposition to resolve into one of the alternatives of the superposition. I agree with this statement for the most part,.... however the notion that "[quantum] interaction causes the superposition to resolve into one of the alternatives" is problematic, given that there is no mathematical mechanism in standard QM that allows for wavefunction collapse in the deterministic Schrodinger equation, so that decoherence does not resolve the measurement problem entirely nor explain why a particular conceptual value results as opposed to another. This is at present unresolved,... so such statements should be qualified with the phrase "appears to", as that is all that decoherence can do,... give the appearance of the emergence of macroscopic reality by loss of phase coherence and thus loss of interference terms that are responsible for QM weirdness. @Noum, you're just denying the Born Rule from the other end. Once the interaction occurs, the superposition is resolved. You can see that happen in a cloud or bubble chamber. It's not philosophical, it's directly observable. What if rather than a cat what we put is a bomb, activated by the same particle decay, and we stay close to the closed box. In this case, are we the ones that are dead and alive at the same time? You could use QM to Test The Bomb so you won't get blown up. @noumenon thanks for the link, it's pretty interesting. What if we put the interferometer detectors very far away, would the experiment still work with a delayed measurement? I don't regard the wavefunction as a physical wave of anything but rather as a means for establishing probabilities, so no, I don't deny the Born rule,... nor the probability interpretation for each extended "history", (if you were referring to CHI). There is an experiment that requires an apparatus at least large enough to change the conditions of the experiment, called Delayed Choice Quantum Eraser. In general, as long as there is no other disturbance to the photons, the distance should not matter. The cat is either dead or alive. We don't *know* which until we open the box and look. That's not what QM says. Prior to measurement the quantum state of the system is a linear superposition of all possible states given the quantum operator (which in effect is a representation of the experimental apparatus). Then what makes the interference in the Young dual-slit experiment? This becomes even more puzzling when the same experiment shows interference for electrons. If it's not physical, how can it produce a physical effect that is unmistakably a wave effect, viz., interference? What's waving, @Noum?